The Association for Rural & Small Libraries Conference housing is now open for reservations. 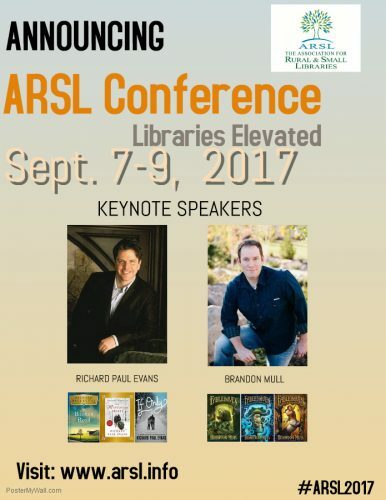 Rooms at ARSL sell out fast, we encourage you to book your room today and join us for ARSL2017 in beautiful St. George, UT. The Hilton Garden Inn is our conference hotel this year with a rate of $109 per night. Book your reservation now. Room rates are available for extended nights prior to and after conference. Our online code should show up automatically but it’s ARSL just in case you need it. You can also book by calling 435-634-4100 to make your reservation. Be sure to tell the agent you are attending the ARSL Conference to get the discount. Booking early also ensures you get the room preferences you need, particularly for sharing with a friend or colleague. The overflow hotel is the Holiday Inn in St. George: Book your room here. Room code is ARL. If you prefer to book by phone, call 435-628-8007 and mention you are attending the ARSL Conference for the $109 rate. Both hotels are within walking distance of the Conference Center. Contact Vicki Bartz, 2017 Conference Chair, with questions: vbartz99@gmail.com.